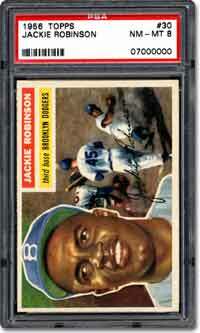 A 1956 Topps Jackie Robinson card is now part of marketplace history. On March 9, 2004 it was registered as the seven millionth sports card graded by Professional Sports Authenticator (PSA), a division of Collectors Universe, Inc. The card is graded PSA NM-MT 8, and the historic serial number, 07000000, is printed on the encapsulation holder's insert. The milestone was reached about a year after PSA recorded its sixth millionth card, and a little over 12 years since the company received its first sports card submission in July of 1991. "This is an amazing landmark for PSA and it confirms PSA's position in the marketplace as the leader in 3rd party authentication and grading. When PSA first started, it took some time before dealers and collectors realized the benefits of 3rd party involvement. When they did, the demand skyrocketed. We reached our one millionth card in 1998 and have graded another six million cards since. The consumers have made it abundantly clear that PSA is here to stay and we appreciate all the support we have enjoyed during our nearly 13-year run," said Joe Orlando, President and Editor of Sports Market Report magazine. "We think the card market is a better place now for consumers because of third-party grading, and we're glad we were a big part of the revolution. Peace of mind is what we provide and, without a sense of security, it can be a dangerous place for prospective buyers. Our success is based on credibility and trust." 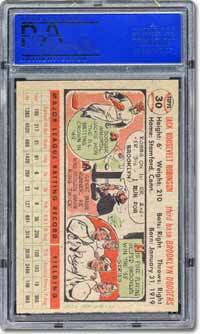 The milestone card, a 1956 Topps Jackie Robinson card (#30) was submitted by Doug Diggs of Freemont, California. Orlando personally contacted Diggs to surprise him with the news that his card was something extraordinary for the company and to share the significant achievement with him. Orlando believes the milestone underscores the strength of the high-quality sports collectibles market as well as third-party grading. "The market for high-quality sports collectibles is excellent. Even when the economy fluctuates, the premium items never seem to have a problem finding a home because of the inherent desirability associated with them. Quality has always been the key. We are currently authenticating and/or grading over 100,000 collectibles per month, which includes the grading of cards and game tickets as well as the examination of autographs and game-used bats," he said. Among the seven million cards submitted to PSA over the past 12-plus years are several of the world's most valuable sports cards, including the finest known T-206 Honus Wagner card (PSA Near Mint-Mint 8) which set a record at a MastroNet auction in the summer of 2000 -- selling for $1.265 million. PSA estimates the total declared value of the seven million cards submitted to be nearly three-quarters of a billion dollars.